My refrigerator is going down! My husband noticed some ice building up in our frost-free bottom freezer, so he checked it out and came to the conclusion that it was the seal going bad. He ordered a seal and it did not arrive after a week. He was about to cancel the order and go with another company when it did arrive, only it was for the refrigerator section, not the freezer. Finally, the right seal arrives after another week. He placed it on the freezer door and we hoped all would be golden. That was his battle. My battle began when he left for a youth mission trip with our daughter and some others (more on that to come) and gave me instructions. I have a refrigerator/freezer thermometer....somewhere, but I am still not finding it. However, I knew that the freezer was not getting cold enough; everything that was frozen stayed frozen, but the items on the door were not. However, now the refrigerator was not cold enough either and probably had not been for a while. Who really pays attention enough to know when the air blowing into the refrigerator is not cold enough or not blowing strong enough, to know that with just a feel, unless it is something you do for a living. Well, I finally figured that out, but what to do about it was another thing. This refrigerator was the first appliance that my husband and I bought together after we were married. It was a high-end floor model with a couple of small dings (hidden with magnets) marked down by half. It survived the move from Florida to Georgia, so it is at least 20 years old, maybe more like 25 to 28 years. So, I was thinking with Thanksgiving and Black Friday practically upon us, it probably is the best time to for getting a really great deal on a new refrigerator, but the worse time for a refrigerator to go down and try to get one in within a few days. Still, I spent quite a few hours looking online for that dream new stainless steel beauty that I have been waiting for some years now. In fact I look at refrigerators every time I am in a store with appliances. 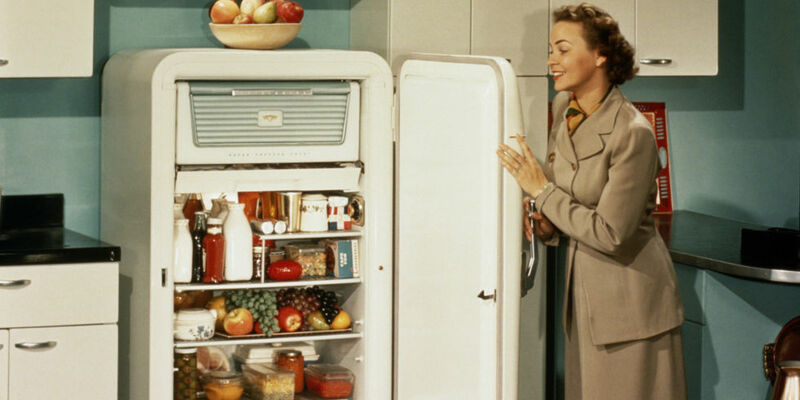 Being mostly fresh food eaters, our refrigerator just never seems adequate. it would be my dream to have a kitchen with one full size refrigerator with a matching freezer beside. Yeah...such a nice dream! Now I have to say that we have three freezers. Two large ones are in our garage and are definitely not frost-free. One is an upright and the other a deep freezer. They are pretty full currently. Remember we raise rabbits. I have skins to tan and meat, lots of frozen veggies and fruit, bulk grains and flour, and so on. I would love to have a second refrigerator there may be a small one to store things like cheese and other bulk buys, but space is a problem. In the meantime, I really needed to see if I could get the refrigerator colder somehow, so I took out half-gallon frozen containers that we use for our cooler on our errand/shopping day and placed them in the refrigerator. I put everything from the bottom freezer in the other two, and that is when I noticed the ice at the back of the bottom freezer. I would have turned off only the freezer, but in my unit the on-off control is in the freezer and it controls it all. I do not know if they still make refrigerators this way but that would be a feature I would be looking at in the future. So, off it all went and I just waited until the ice melted enough that I could work it off. As the ice melted down, I noticed there was another slit that ran across the back of the freezer with a lip like it was a drip strip to catch water in the defrost cycle, only there was too much ice to defrost in such a short time. Now I have to say, it would have been so nice if I could have taken the shelf and baskets out of the freezer to get to the ice, but our freezer has a door and it is next to a wall so those things cannot come out and I have to crawl in over the shelf to clean out all the ice and water. (The next refrigerator will have a drawer freezer.) So, after seeing that opening, I thought it would make sense that it was for airflow also, recycling the cold air to make it colder would be efficient. The frost there seemed to be the main problem left over from the bad seal. When it was finally cleared, I turned the refrigerator back on and definitely felt a stronger air flow, but it was not as cold as I thought it should be. I was hoping that it was just because it had been off for nearly 8-hours and the freezer air was not cold. Then it happened! My refrigerator began going down...in temperature! Still not finding my refrigerator thermometer, I came up with this idea to use our wireless indoor/outdoor digital thermometer. I placed the outside on in the freezer and the inside one in the refrigerator. So, my aging refrigerator is still working well, but I am still considering getting a new one soon. I really do not want it to be an emergency especially around the holidays. However, I have to say that messing with it made me more aware of the features I would want and definitely not want. Thank you, my Lord, for the good You provide, for being with me even while my family is away. Help us to make good decisions with which the money You have provided us.